Beds: 2 queens, 6 twins, sofabed in the TV room. 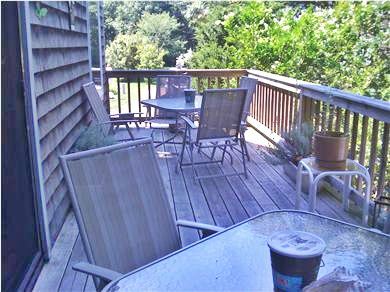 This lovely and beautifully furnished three-story home is located in a quiet residential section of Oak Bluffs. It is a fifteen-minute walk to the beach and only a five-minute walk to the Gingerbread Cottages and to Circuit Ave for shopping and entertainment. The main floor consists of a living room and sitting room, two twin bedrooms, a bath, and a deck off the living room. The living room has skylights and a cathedral ceiling. There is also a second deck on the main level that will accommodate 12-15 people. The lower level consists of a good-sized living room/kitchen combined; a small TV room; a large master bedroom with queen bed and sitting area; a small bedroom with twin beds and a small black and white TV. The third floor has a fully equipped kitchen with breakfast bar and a large table that seats ten; a master bedroom with queen bed and skylights; a full bath; and a wrap-around deck that extends from the kitchen to the master bedroom. Amenities include cable TV, DVD player, stereo sound system, dishwasher, computer hook-up and washer/dryer.Outdoors, you’ll find a quiet, rustic environment for children to play, a large outdoor shower; deck and lawn furniture and an outdoor fireplace for cooking or warmth. There is also room to park 4 cars. Additional availability info: Owner will pay half the state and local short term lodging taxes. This is a Sunday to Sunday vacation rental. Additional pricing info: We will allow a discount for two week rentals. State and local taxes of 11.7% will apply. Two bedrooms and one bath on main floor. Seven steps into house. We enjoyed our recent stay. The house was clean and comfortable, with several areas inside and out to relax. The house is on a quiet street, and it is a short walk to Circuit Ave.
My family and I enjoyed our stay at this rental property. The property itself was clean and spacious. The beaches and restaurants are within walking distance. I would highly recommend this property, and I look forward to renting it again. We have rented this home for the past two years. It is a beautiful, airy house in an excellent location. The deck is like an extra room. There is plenty of parking. I hope to rent it again in 2013. I am happy that you enjoyed the house. Hope to rent to you in 2013. Enjoy the rest of 2012. PS Let me know in January if you are still interested.